Written By: Ldn Rd Janet Bond Brill, Ph.D. If you have high blood pressure, you're not alone: nearly a third of adult Americans have been diagnosed with hypertension, and another quarter are well on their way. Yet a whopping fifty-six percent of diagnosed patients do not have it under control. The good news? Hypertension is easily treatable (and preventable), and you can take action today to bring your blood pressure down in just four weeks-without the potential dangers and side effects of prescription medications. 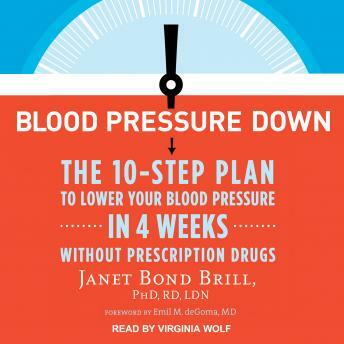 In Blood Pressure Down, Janet Bond Brill distills what she's learned over decades of helping her patients lower their blood pressure into a ten-step lifestyle plan that's manageable for anyone. You'll harness the power of blood pressure power foods, start a simple regimen of exercise and stress reduction, and stay on track with checklists, meal plans, and more than fifty simple recipes. Easy, effective, safe-and delicious-Blood Pressure Down is the encouraging resource that empowers you, or your loved ones, to lower your blood pressure and live a longer, heart-healthy life. by Ldn Rd Janet Bond Brill, Ph.D.